Its All in the Planets is about Aniket, an average looking, 27-year-old tech guy. Out of his luck, he gets along with Trish – stunning and hot model. Trish sets some relationship goals for Aniket that include reducing his pot belly and get rid of geekiness. Talking of geekiness, Aniket also has friend Subbu who is a code geek. On the other side, there’s a lady in her early thirties, Nidhi. She leaves her corporate job on the calling of her real passion. She is engaged to Manoj who is an ideal man for every girl. Nidhi and Aniket meet by chance on a train and eventually she agrees to be his Love Guru. Few small events take the story forward to make a profound impression on their lives. 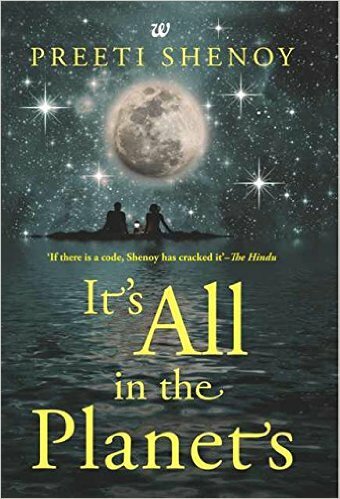 Putting it in short, Its all in the Planets by Preeti Shenoy is about one man, two women and the trap called Destiny. Some things, as they say, are in the planets. Those readers who like books on complicated relationships and have a rock-solid belief in Destiny should definitely read It’s all in the Planets. Preeti Shenoy is entitled as the highest selling female author in India. She has written more than half a dozen novels. She’s continuously nominated for the Forbes List of the 100 most influential celebrities in India for past 3 years. Preeti Shenoy is a woman with several talents from photography and yoga to sociology. India Today calls her ‘the only woman in the highest-selling league,’ alluding to the immense popularity of her books.